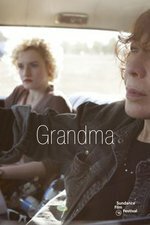 Self-described misanthrope Elle Reid has her protective bubble burst when her 18-year-old granddaughter, Sage, shows up needing help. I'm glad that I knew going into this how short it is (just under 80 minutes) because I'm afraid if I was expecting an average length I'd have been thrown by how quickly it wraps up, and it might have affected how it played for me as a whole. Obviously Lily Tomlin is great in it...Everyone is, really, but of the supporting players I was especially impressed with Sam Elliot. I know I've seen him in a ton of things, but I don't think I've ever seen him this nuanced and vulnerable. AintItCool.com interviews Sam Elliot and Paul Weitz. I really loved this. So much information packed in those 80 minutes. I loved how Grandma's lifetime came out over the course of the day. The Sam Elliot part was heartbreaking and excellent. (spoilers.....) How he kept that picture in that precious box, indicating a lifetime regret for this relationship with Elle (despite the 3 other marriages). And the grandchildren's toys all over, but no grandchildren in sight. Only one sentence needed to tell us all 4 marriages ended for this person. Here he is in this beautiful house, he's always been good with money, but he is alone. How he pushed for more from Elle. I came out of the theater thinking how sad he was but there was something weird about it. With time I started to think probably during their relationship he was like that. He just pushed and pushed for more from her and she couldn't give that to him. She felt she had to secretly leave him and then had a lifetime relationship with someone else. Maybe she was suffocating unded this marriage isolated on this boat, not being true to who she was yet, not feeling the same obsessive emotions that may have made Karl (who may or may not have been the Orge in her poem) so controlling. She felt she had to leave it in secret. She didn't want to be tied to him for life with his child. Maybe like how the granddaughter would rather not be tied to that turd boyfriend for life over a child. I liked the comment in the article doctornecessiter links about how his broken heart was the treasure he hoarded, and that menacing comment about teeth. My husband and I talked about the toys too, maybe he was hoarding them to attract the grandchildren, but the children were too scared to come. He is an ogre. And wow do I ever feel sad for him despite all that! He was so very vulnerable. It was beautiful and sad and wonderful story telling with such little time. This movie is like a poem. Shorter than prose but more emotionally dense. The bit that stays the most with me over that scene however, like with a lot of poetry, is how I connect with it in my own life. As I get older will I harbor regret like that. Will I have painful wounds that can dangerously open over a shared joint and a beer. Wow I hope not. I really enjoyed this movie so much. Quick notes: I love everyone in this movie so much. Elizabeth Pena! I miss her. Judy Greer always so great. Marcia Gay Hardin and her office! And a great part for Laverne Cox. And Sam Elliot's comment about how he was going to go work on his jeep - and it's a toy. And it creates incredible frustration in seconds because it won't work. So much good stuff! Saw it this weekend, loved it.